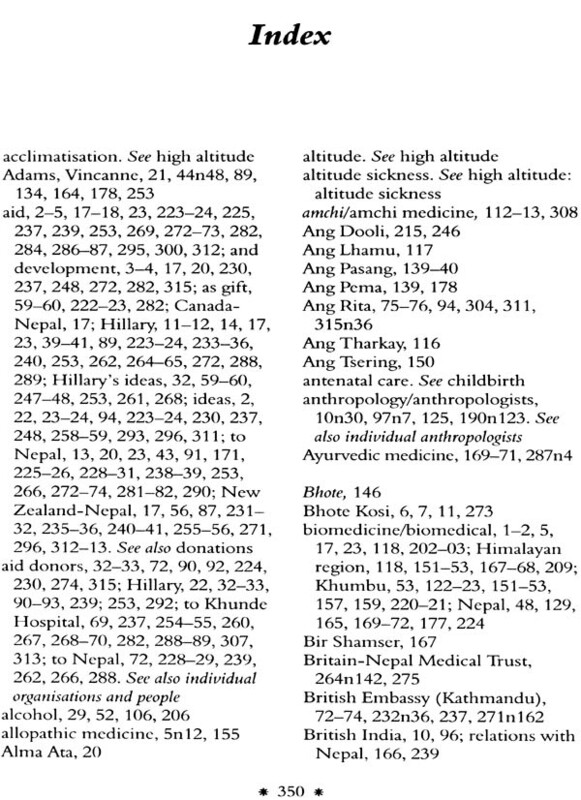 Why read a book about a small hospital in the mountains of Nepal? 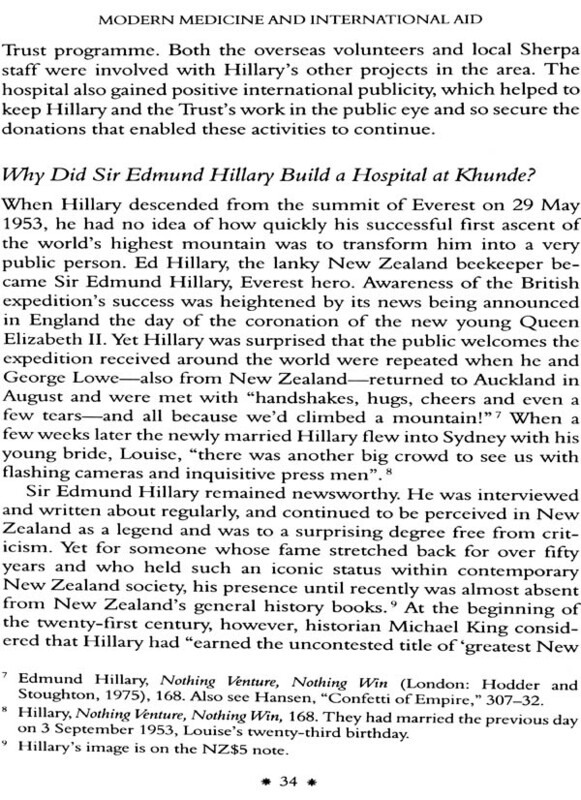 In 1966 New Zealander Sir Edmund Hillary, "hero" of Everest, built a small hospital for the celebrated Sherpas of Himalayan mountaineering. 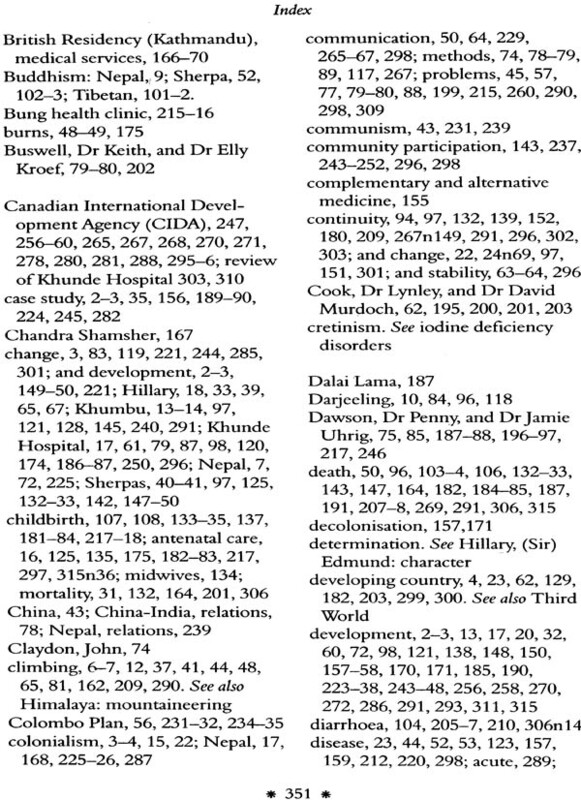 Throughout much of the world foreign aid and health care became deeply entwined during the second half of the twentieth century: Despite all the money that was spent, and all the reports and literature about aid and development, however, remarkably little is known about the implementation of projects or why health programmes may not be as successful as planned. 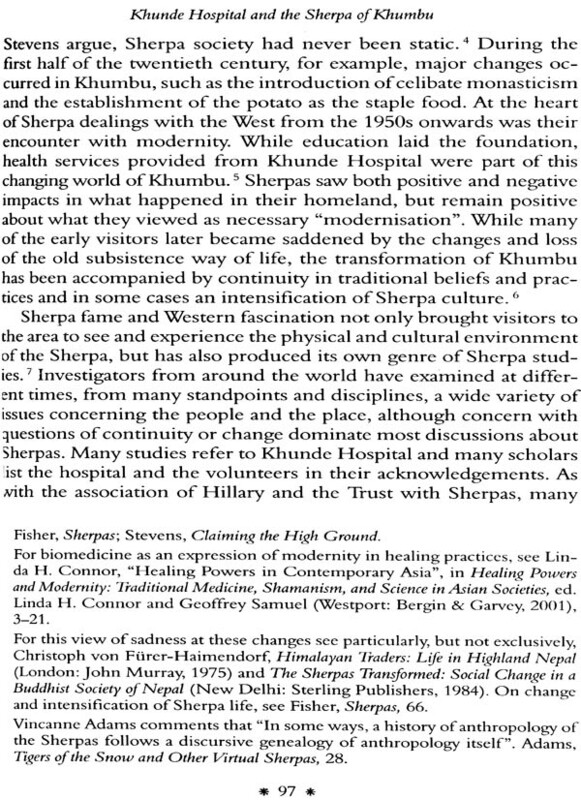 Set in the rugged, remote and high-altitude environment near the world's highest mountain, this history of Khunde Hospital provides a detailed case study about both an ongoing encounter between Sherpas' beliefs and practices about sickness and their use of "modern" medicine, and the implementation of an aid project that is situated against a background of changing ideas and practices in international aid. Students of development studies, international health, medical history and anthropology will find this book not only engaging but rich in field-work data. Susan Heydon is Lecturer in Social Pharmacy at the University of Otago. 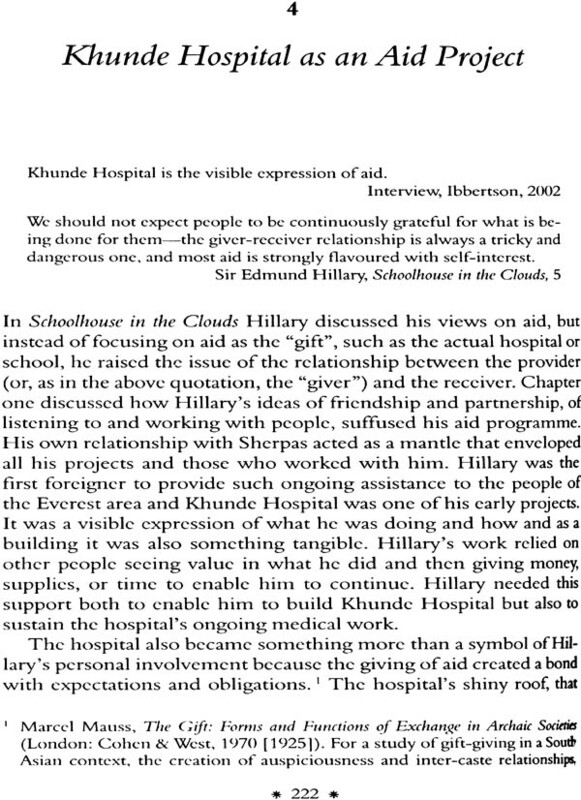 Between 1996 and 199H she was a volunteer with her family for the Himalayan Trust at Khunde Hospital. Her ongoing research interests focus on issues surrounding the implementation of health policies and programmes. Her new research will focus on the use of medicines. 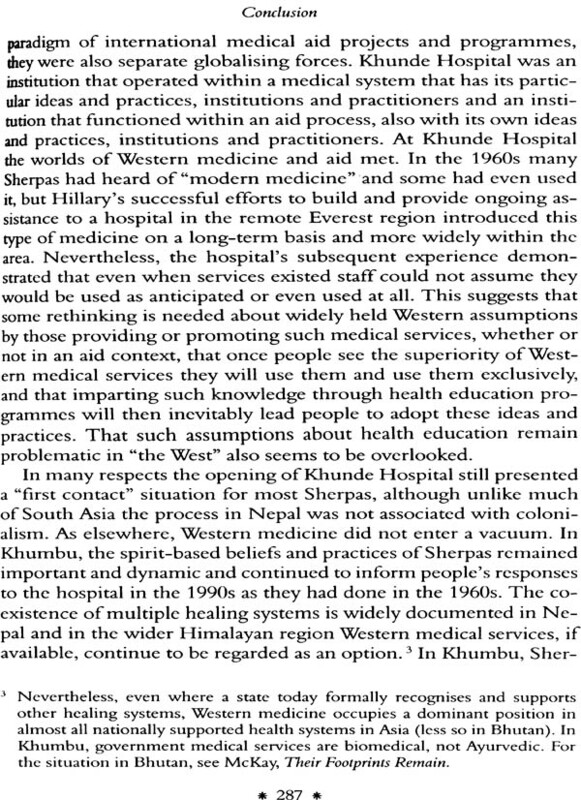 In December 1966 a small hospital opened in a remote, mountainous and high-altitude region of Nepal to provide medical services for the approximately three thousand people who lived in a series of villages in the surrounding four valleys. Although little more than a one-roomed, if well stocked, clinic with facilities for patients to stay, the hospital offered a range of outpatient and inpatient, curative and preventive services. It soon became the main provider of biomedical services for the area, a position that it continues to occupy today. 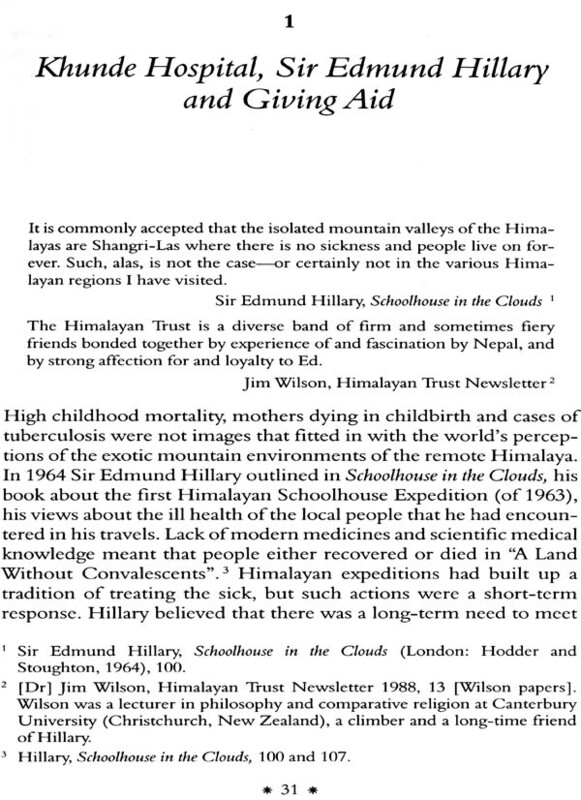 Why Read a History About a Small Hospital in the Mountains of Nepal? 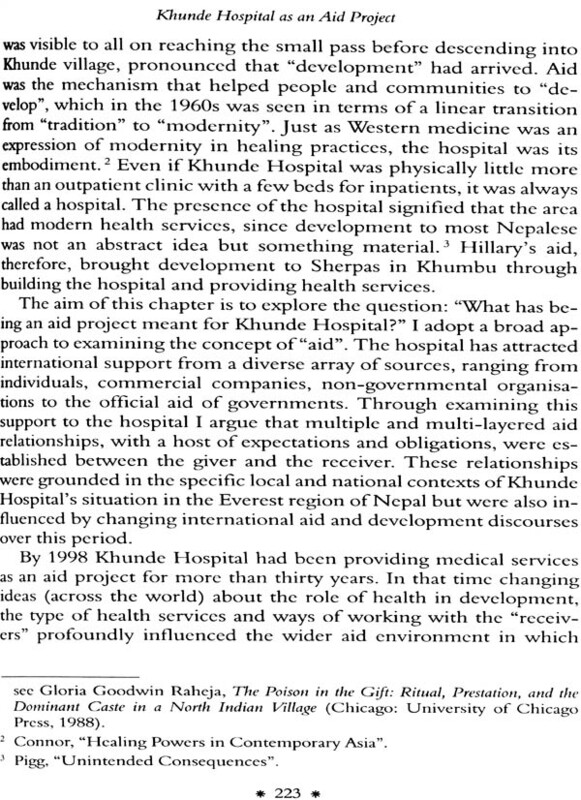 At this point the reader could be forgiven for wondering why anyone from outside the region would be interested in the handful of buildings and staff that provide medical services for this small group of people, but three things make Khunde Hospital a very distinctive institution. 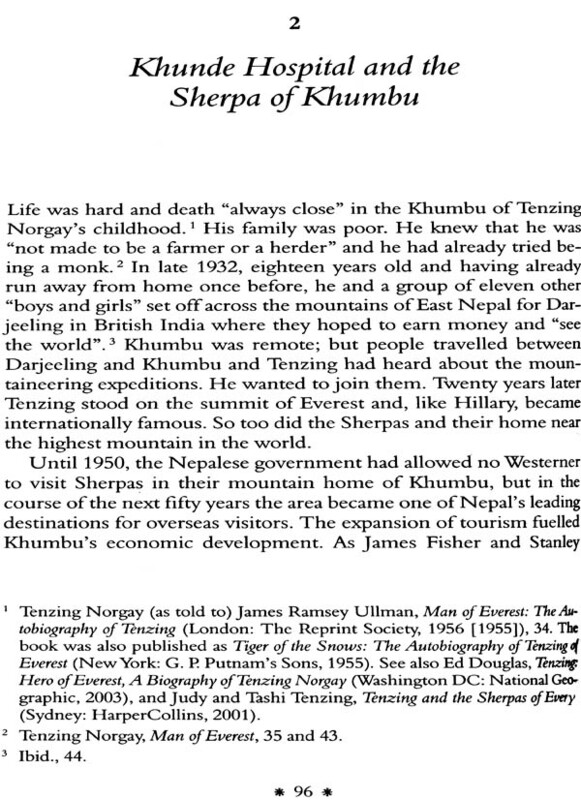 It is situated near Mt Everest, the highest mountain in the world; the local inhabitants are Sherpa who became internationally renowned during the twentieth century through their role in Himalayan mountaineering; and the hospital was built and is still administered through the Himalayan Trust which was established by New Zealander Sir Edmund Hillary, who became famous worldwide when he and Tenzing Norgay were the first to step on to the summit of Mt Everest on 29 May 1953. 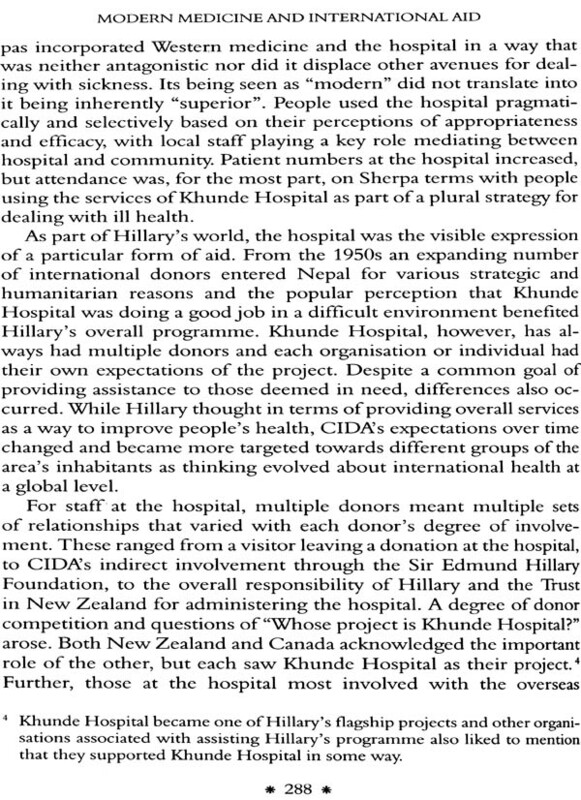 The Everest area is one of Nepal's most popular tourist destinations and Khunde Hospital enjoys a high international profile receiving hundreds of visitors each year. 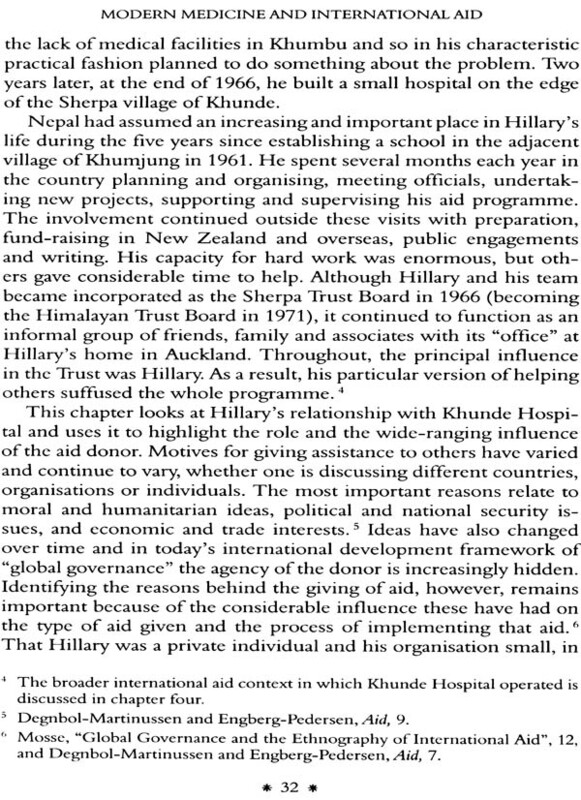 Hillary's aid work is well known around the world and much has been written about his life, but a study of his work in Nepal is lacking. 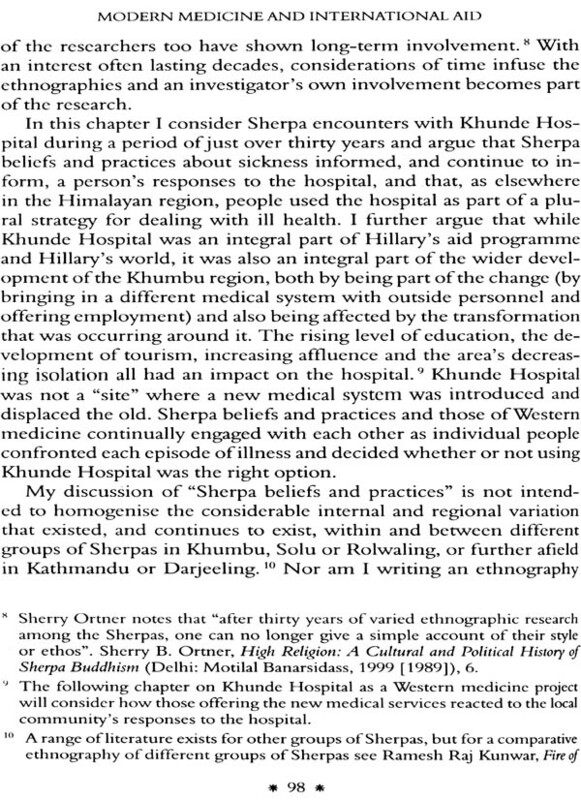 While a book about the hospital is of interest to those who would like to know more about the people involved and the place, this book is a detailed in stitutional study that also adds to the extensive and diverse scholarly literature about Sherpas and change and development in the Everest region. Its focus is on an agent of the modernising process instead of those being modernised, and its analysis, although drawing on work from other disciplines, is historical. 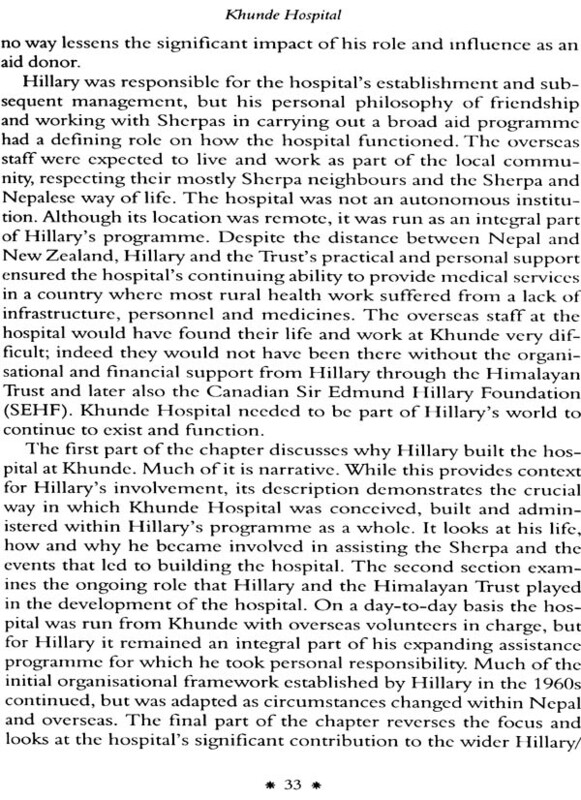 This study of Khunde Hospital is grounded in a discussion of Hillary's particular form of aid, the shifting discourse of international medical aid between the 1960s and the 1990s and the unique world of the Sherpa of Khumbu (the Sherpa name for this area). 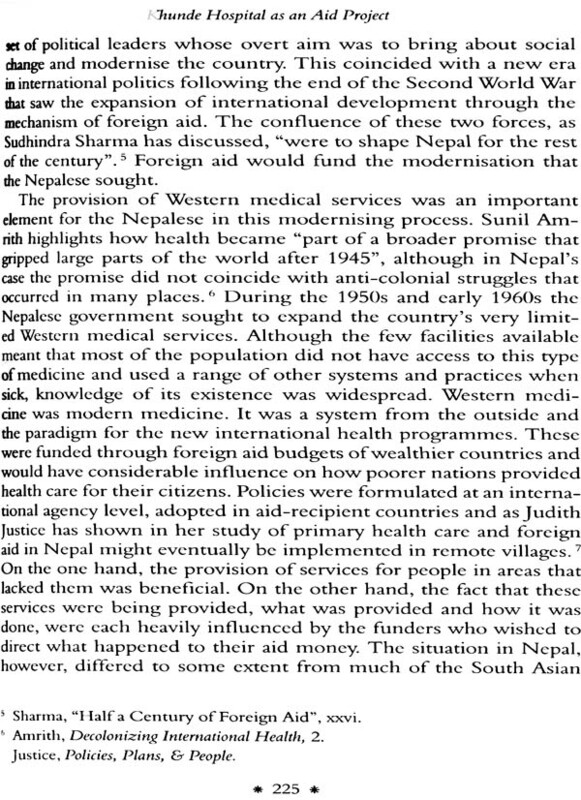 It reveals the complexities and interconnectedness of the dual processes of the implementation and ongoing management of a foreign aid project and the introduction an continuing provision of biomedical services. 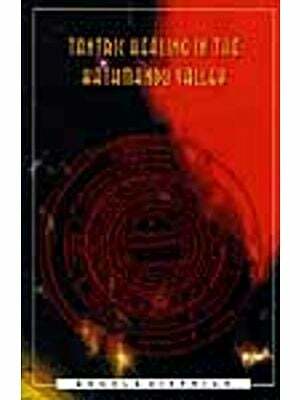 Yet, to be of more than local interest a book needs to address and make a contribution to wider debates. 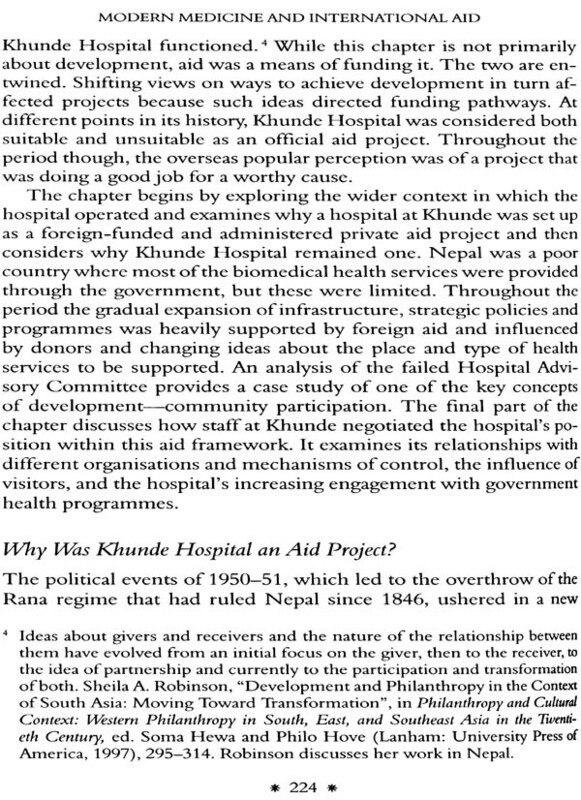 This history of Khunde Hospital starts from a position of considerable disadvantage: histories of hospitals, and about medical institutions in general, are unfashionable topics for current historians; the case study method face an inherent weakness of whether general inferences can be drawn from a study of a particular example; and additional to this concern, Khunde Hospital is very small and very unusual. It is neither a representative "Third World" hospital nor a representative "Third World" aid project. Nevertheless, anyone who goes into a hospital knows that medical institutions are too important to be ignored. More investigation is needed-not less, but this research needs to shift from the antiquarianism of many institutional histories. The case study approach is . a positive strategy in this book, because its focus on a single project allows the possibility of being able to undertake detailed analysis of the institution, its work and the wider society in which it is situated. The small size of Khunde Hospital becomes an advantage. The project of analysing the hospital as a whole becomes manageable and in so doing reveals the multiple complexities involved in providing health care-about which we need to know much more. All medical institutions and health systems, regardless of their size or location have both unique and common features, and we can learn from their similarities and differences. We can also learn from their histories. "Path dependency", the idea that historical developments can significantly influence current policy arrangements and the capacity for change, is a key notion in the study of policy. Similarly in institutional theory, history shapes institutions.